It was a series comeback the likes of which we have never seen in Pro A, and is rarely found generally in basketball. Villeurbanne returned from a negative 2-0 record in the series against Strasbourg, winning three games in a row to celebrate its 17th French championship. It was a series comeback the likes of which we have never seen in Pro A, and one that is rarely found generally in basketball. Lacking the home-court advantage, Villeurbanne returned from a negative 0-2 record in the series against Strasbourg, winning three games in a row to celebrate its 18th French championship. Their 80 – 77 road victory in the last final arrived mainly through the hands of a spectacular Casper Ware. The American guard was unstoppable, particularly in the first three quarters of the game where he dropped buckets in abundance to help his team build even a 22-point (!) lead, 45 – 67 a little before the fourth quarter. The survival instincts and the pride of Strasbourg then made an appearance, mainly through the raving action of Rodrigue Beaubois. He led the charge for an impressive 14-0 run that made the score 67 – 72, four minutes before the end and brought a new interest to the Final. Even though momentum was at their hosts’ side, Villeurbanne managed stay ahead in the score. When Beaubois “talked” again for the 74 – 75, Ware and David Andersen were perfect from the free-throw line, to keep their team safe from harm, completely thwart their opponents’ efforts to claim the game, and hear the sound of the final buzzer with their arms in the air. 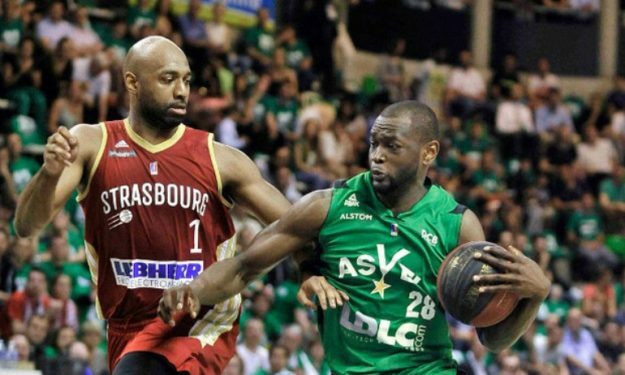 Caspar Ware was the go-to-guy for Asvel and was named Finals MVP, after finishing the match with 27 points. Charles Kahudi recorded a double-double of 11 points and 10 rebounds. Strasbourg failed to make the repeat, despite the valiant efforts by Rodrigue Beaubois who scored 23 points and Mardy Collins who added 21 plus 5 assists.